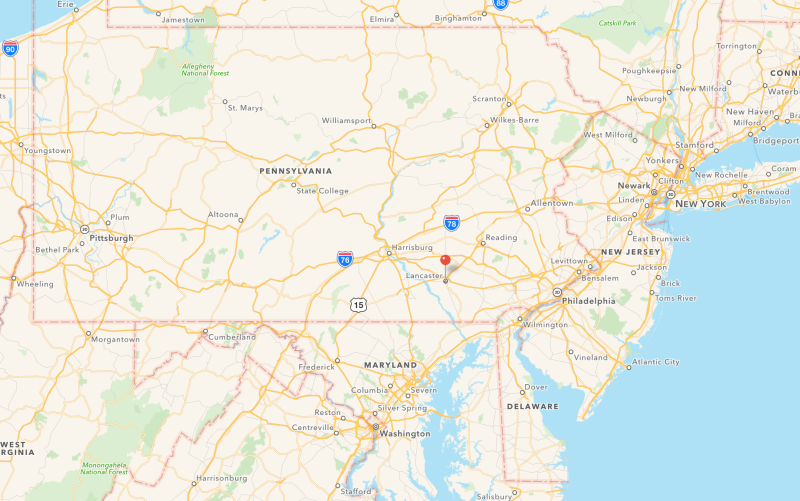 Lancaster is a city that is located in the South Central part of Pennsylvania and it is one of the oldest towns located inland in the United States. The 15th President of the United States, James Buchanan, lived in Lancaster and his estate of Wheatland is a popular destination in the area. There are two notable things that were invented in Lancaster. One of them was the Hamilton Electric 500, which was the first battery powered watch. This watch was invented by the Hamilton Watch Company in 1957. The most popular Easter candy, Peeps was invented by the Rodda Candy Company of Lancaster during the 1920s and was produced in Lancaster until the company was sold and the production moved to nearby Bethlehem. As I mentioned above, Wheatland is a popular destination for many travelers who visit Lancaster and my family was no exception, because we went there as well. The brick house is located on Marietta Avenue and we learned that it was built in 1828 by a local lawyer. President Buchanan (often cited as the worst rated President in history) was the third owner of the house and he lived there for two decades. During our tour, we were able to hear many stories about the President and the person he was as well as walk through the house and galleries. I absolutely love the Amish way of life and am always trying to learn more about their culture and traditions. This is probably one of the main reasons why I chose Lancaster as our destination for this trip. We went to an Amish Village and were able to take a tour of an authentic 1840’s farmhouse. We also got to explore the 12 acres of land that the village is located on and learn a little bit about how they teach school in the one room schoolhouse. We knew that our time in Lancaster would not be complete without a stop at the country’s oldest farmer’s market. Central market is open all year long on Tuesdays, Fridays and Saturdays and we found that it is the best place to find local foods like Pennsylvania Dutch sausage, scrapple and headcheese. Every local knows that Central Market is the only place in Lancaster where people get together to meet and socialize on a regular basis, which is most likely why it has been located in this area since 1730. The Cork Factory Hotel was built in 1865 and many companies did business there including Lancaster Cork Company, Armstrong Cork Company and Kerr Glass Manufacturing. The hotel opened in 2009 and each guest is treated like a member of the hotel’s family. All of the rooms boast the factory’s original brick walls and they are cozy and comfortable. The Cork and Cap Restaurant is located on site and they serve lunch and dinner daily. They use local ingredients in all of their meals and I love how they serve traditional Pennsylvania Dutch comfort food. It was the perfect place to relax after a long day in town. The Lancaster Arts Hotel is located in a building that was built in the 1880s and the 63 guest rooms can be found where the old tobacco warehouse was. I loved walking through the hotel, because they have so many works of art on display. When I was there, they had 269 pieces of art that were created by 36 different artists. This hotel is located very close to many different attractions in Lancaster, so it is the perfect place for people who want to see everything that the town has to offer. Since Lancaster is also known as Pennsylvania Dutch country, everyone needs to know that the food is absolutely phenomenal. Annie Bailey’s Irish Pub is a great family place that has a wonderful menu. They have seafood, pub foods, burgers and Irish foods plus much more. I really recommend the Potato Nachos, Chicken Kilkenny and the Peanut Butter Thunder Cake. Four54 Grill is a great place to eat as a family. They serve burgers, pizza, cheesesteaks, fries and other family friendly foods, so everyone should be able to find something that they like here. While they do have drinks that you can purchase, they also have a bring your own bottle policy, so that makes it easy to save a little money while you are dining out and enjoying a delicious meal. For more information on things to do in Lancaster, you will want to visit lancasterpa.com. I hope that you enjoy your time in Lancaster as much as I did with my family.